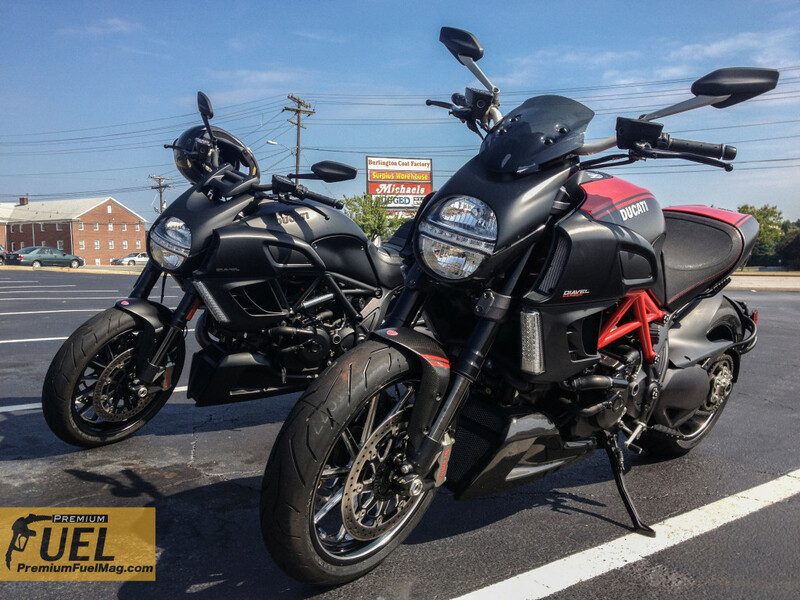 The Ducati Diavel is probably one of the most rare bikes you will ever [or never] see. I have only ever seen one in the wild, and it happened to be on the same day we got to test these beasts out. Before getting into the riding let’s talk a little about Ducati’s “cruiser” I would call this bike a lot of things, however, cruiser would be absolutely last on my list. When you sit down on the seat and place your feat on the mid controls, you don’t find yourself supporting all of your weight on your forearms sport bike style. The seating position is comfortable and relaxed yet still aggressive. Even with your eyes closed, you know you are still on a Ducati and you are ready to attack the curves with ease at any speed. As a whole, the look of the bike takes some getting used to. When i first walked up to it, my only thought was, “it’s a neat bike, but man, this thing if fugly”. Fugly may be a bit harsh, but you have to appreciate the fine details. 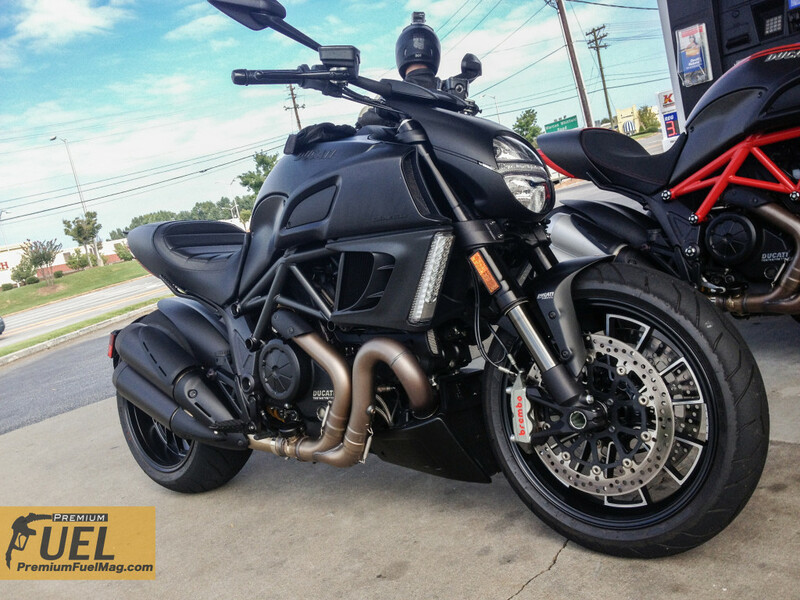 The Diavel comes standard with a massive 240mm tire specially designed by Pirelli doesn’t resist leaning like most big tire bikes. 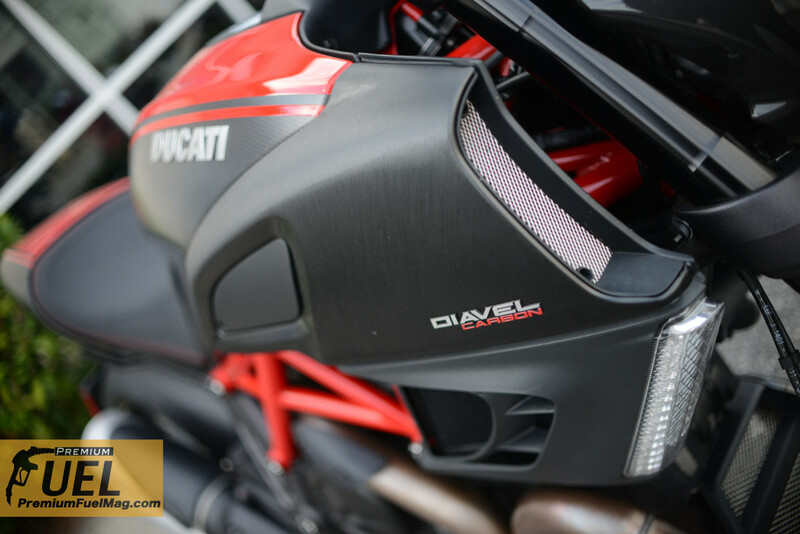 The Diavel of course has Ducati’s signature red frame. Enormous dual Brembo brake rotors and calipers surround the front wheel. My favorite aesthetic feature of this bike is the whole rear setup. The single sided swing arm tucks the brakes and sprocket neatly away inside the rear wheel leaving the right side very clean showing off the deep dish machined aluminum wheel with gloss black paint. The license plate bracket, doubling as a mud flap appears to hover just behind the rear tire. Normally when I get a bike, I’m tearing off the license plate bracket before i even make it home, but this one might stay. The vertical LED tail lights come down the back like bloodthirsty fangs. There’s nothing else out there like it. Up in the front you have Similar vertical turn signals running down below the massive jet fighter-like intakes. The handlebars and mirrors stick up like antennae and seem a bit out of place. Once i got over the somewhat shocking appearance, i had only one complaint; It has an “on” button in place of your typical kill switch, not to be confused with the starter button. This isn’t such a problem, except the on button sits on top of the gas tank underneath the instrument cluster, and there’s about a half inch gap that you have to jam your finger in to activate it, this can be especially difficult with gloves on. You can enter a pin code to start the bike if you don’t have your key, but you won’t be able to get any gas, just keep the key in your pocket, it has a proximity sensor, so there’s no need to ever insert the key. This is a truly wonderful feature. The Diavel has 3 riding modes. First Urban riding mode limits you to 100hp and maximum traction control settings, Next i was shown the Sport mode. Sport mode unleashes the full 162 horsepower and turns the traction control settings to a minimum, but not off. The Ducati representative then proceeded to show me Touring mode, but my brain had already began shutting down, i didn’t care, I was going to ride in Sport mode. 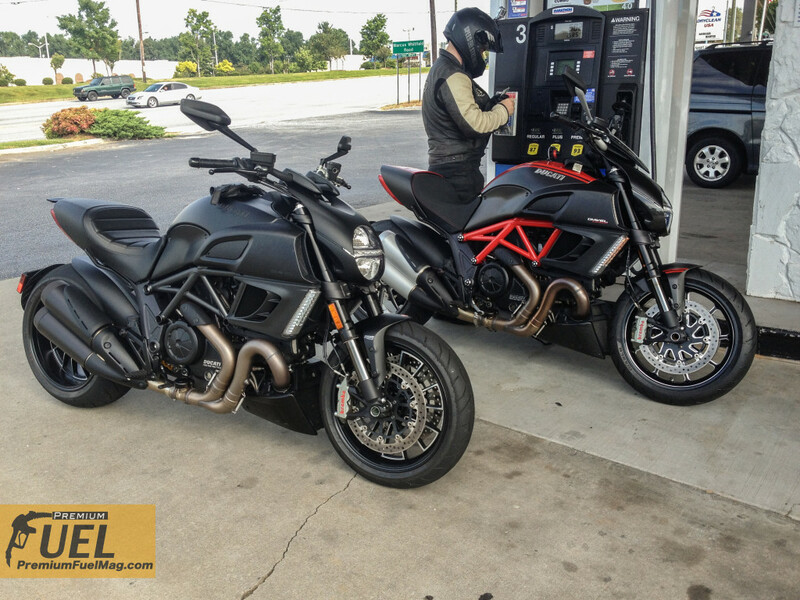 The Diavel’s exhaust note is thunderous, throaty, and powerful. It’s not your normal rough sounding v-twin. With a twist of the wrist, the revs will wind up to 12,000, the exhaust screams and lets off a pop as you up shift. Simultaneously i began to time travel, and became 19 years old again. The power builds from 3,000 rpm’s all the way to the end and starts over with every shift. As the road starts to run out and you roll off the throttle, the motor lets out a deep burp of disappointment, then you kick down 2 gears, dive into a corner, and give it some more gas in a horizontal position. by the way this bike handles, you would think that you were leaning a 250cc race bike. not a lazy “Cruser”. 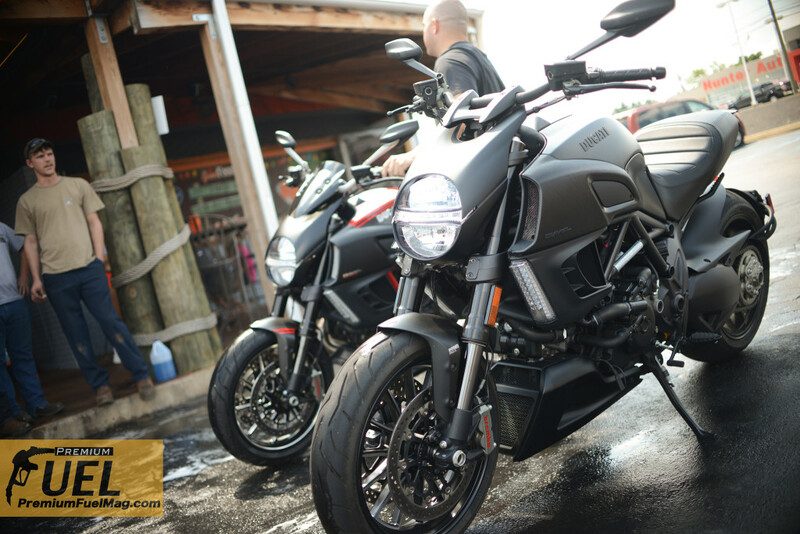 At a track day, the Diavel would eat any appoints alive with ease. Why else isn’t this a cruiser? There’s no on board storage, it weighs the same as your average sport or standard bike, and i’m sure that your passenger would agree that it’s not a cruiser as they hang on for dear life. This bike is a real head turner. People in cars were pointing and waving, and a few folks even came up to ask about it. 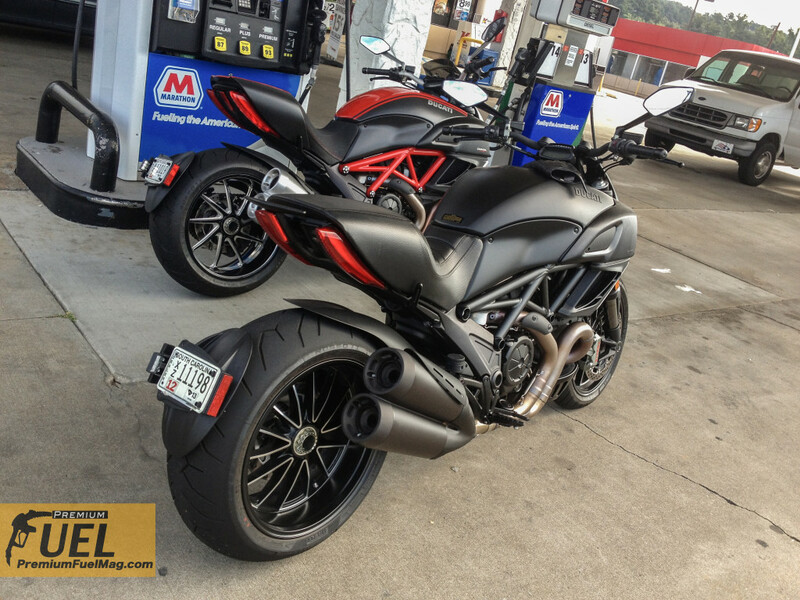 By the end of the day, the Diavel went from being a bike that was “kind of cool” to one of my favorite bikes.